For many years BMW’s M division focused specifically on the company’s cars. First organized in 1972, the group operated under the name of BMW Motorsport, and concentrated on the racing efforts of the Bavarian brand. The first M-badged roadgoing BMW model was the 1978 BMW M1 supercar. The first of BMW’s mainstream models to get the M treatment was the 1980 BMW M535i, followed by the 1984 M635CSi. The M3 debuted in 1985, with the 5-Series based M sedan (M5) following closely on its heels. When the BMW M-cars were first introduced, in an effort to keep them as pure as possible, it was said to be considered a BMW M model, a car had to run a normally aspirated engine and use a manual transmission. In subsequent years BMW went to turbocharging across the board for all its models so that tenet was dropped. And, with the emergence of the X5 and X6 as popular models for BMW, the decision was eventually made to “M-demnificate” the X6 as well. 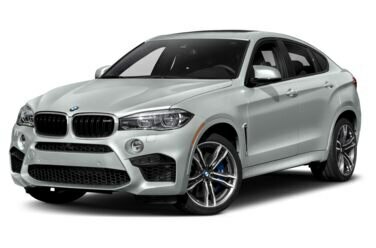 Thus, in model year 2010, the marketplace got its first look at the BMW X6 M. Introduced to the motoring press at the 2009 New York Auto Show, the 2010 BMW X6 M was powered by twin turbocharged 4.4-liter V8 engine producing some 555 horsepower and 500 ft-lbs of torque. A six-speed automatic transmission sent the power to all four wheels and zero to 60 was quoted at 4.5 seconds—just like its then-contemporary M3 sibling. The X6 M and the X5 M were the first BMW M models to feature all-wheel drive and automatic transmissions. To ensure the X6 M cornered and stopped as well as it accelerated, BMW’s M engineering team specified 20-inch wheels and performance oriented summer tires, along with a system called M Dynamic Performance Control. The sport-tuned suspension system featured smart shocks that kept body roll to a minimum, enabling those huge tires to maintain the most effective contact patch. However, rather than cursing the X6 M with a rough ride, the system also endowed the BMW with a suppleness belying its capabilities. The steering and braking systems were upgraded as well. As far as comfort and convenience, the X6 M featured much of the tech you’d expect, including parking sensors, smart windshield wipers, navigation with real-time traffic, and a sixteen-speaker audio system. Options included keyless entry and start, head up display, heated and ventilated seats, a heated steering wheel, and a multi-view camera to assist in parking.